Growers Worldwide Acknowledge That LED Lights Are The Best Grow Lights— And The Future Of Indoor Growing. 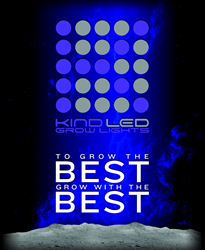 Kind LED Grow Lights are the best grow lights for all considerations. The conversation about the best grow lights, whether HID or LED lights, continues to be a hot topic. With the quickly emerging hydroponic and vertical farming movement, the conversation now expands further than HID vs LED and begs the question of which LED light is the best grow light. There are many factors to consider when choosing the best grow light– spectrum, cost, wattage, PAR output, lumens, electrical safety, enclosure type & size, plant type, yield, and ventilation to name a few. Kind LED Grow Lights have been designed with a proprietary 12 bandwidth spectrum with UV and IR, comprised of 3 watt diodes that run at 650mA spectrum for growth and/or flowering, and don’t waste any energy emitting large amounts of spectral ranges that plants don’t use, making them the best grow lights for the entire plant lifecycle. In comparison, other LED grow lights run at 500mA with only a 6 bandwidth spectrum and HIDs are designed to a specific portion of the full light spectrum. This means that HID users must purchase multiple HID lights to compliment both the vegetative and flowering stages and compete with Kind LED Grow Lights for the title of best grow lights. Kind LED Commercial Grow Lights challenge the standard of high-performance horticulture lighting technology, redefining consumer expectations of the best grow light, having passed the extremely stringent safety requirements needed to earn a certification from respected UL Laboratories. In comparison, certifications for HID and LED grow lights are extremely rare. Yet, for commercial grow operations, electrical safety certification is an absolute requirement. Kind LED Grow Lights use 40% less power than HIDs. With a cost savings of roughly $420/ month (over $5,000 during the course of its 50,000 hour lifetime), and no need for extra inline fans, ducting, or AC units (roughly another $3600 plus costs of electricity), the highest yields (1.4 grams per watt, while, for example, the HID Gavita came in at about .84 grams per watt), UL electrical safety certification for commercial grows, and lifetime customer, technical, and grow support, Kind LED Grow Lights are the best grow lights for all considerations.